STX Entertainment has released a new featurette for Luc Besson’s (The Fifth Element) upcoming sci-fi epic Valerian and the City of a Thousand Planets. 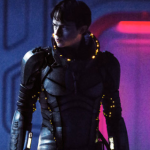 Based on Pierre Christin and artist Jean-Claude Mézière’s graphic novel series Valerian and Laureline, the film centers on “two special operatives (Dane DeHaan and Cara Delevigne) for the government of the human territories charged with maintaining order throughout the universe”. Clive Owen, Dane DeHaan, John Goodman, Rutger Hauer, Rihanna and Sam Spruell star. Valerian and the City of a Thousand Planets opens in theatres July 21, 2017.